Founders Entertainment is proud to announce the lineup for the 2018 Governors Ball Music Festival. 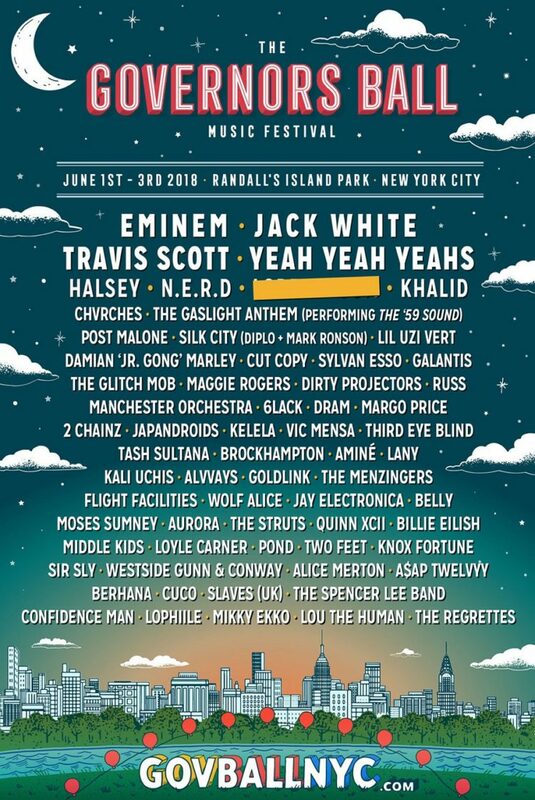 The eighth annual edition of New York City’s very own homegrown fest will take place from Friday, June 1st through Sunday, June 3rd on beautiful Randall’s Island Park. Featuring performances from Eminem (his first headline show in NYC since 2010), Jack White, Travis Scott, Yeah Yeah Yeahs, Halsey, N.E.R.D. (first NYC show since 2010), Khalid, the worldwide debut of Silk City (a new project from Diplo and Mark Ronson), a reunited The Gaslight Anthem performing their breakout album The ‘59 Sound, and many more, Governors Ball will showcase over 65 artists throughout the weekend. 3-day GA and VIP tickets (including payment plan options) are available now via GovBall.com at special “Announce Day” pricing until 11:59:59 PM EST. Regular pricing begins January 4th at 12:00 AM EST. Full festival lineup and poster below.